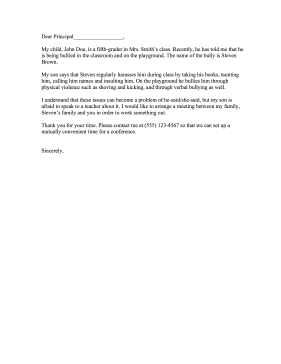 Parents can notify teachers and school administrators of bullying among students with this education complaint letter. My child, John Doe, is a fifth-grader in Mrs. Smith's class. Recently, he has told me that he is being bullied in the classroom and on the playground. The name of the bully is Steven Brown. My son says that Steven regularly harasses him during class by taking his books, taunting him, calling him names and insulting him. On the playground he bullies him through physical violence such as shoving and kicking, and through verbal bullying as well. I understand that these issues can become a problem of he-said/she-said, but my son is afraid to speak to a teacher about it. I would like to arrange a meeting between my family, Steven's family and you in order to work something out. Thank you for your time. Please contact me at (555) 123-4567 so that we can set up a mutually convenient time for a conference.